Have you ever tried riding a tandem bike? I’ve ever rode it with my SIL, while we visited Pangandaran Beach (Ciamis, Jawa Barat), some years ago. You can rent tandem bicycle in cheap price there. Some recreation places usually offer tandem bikes for visitors to rent. Tandem is a multi seat bicycle with riders seated one behind the other. Most often the term refers to two seater bikes, but tandem is also the generic term for other multi-seaters like triplets (for 3) and quads (for 4). Tandems are an ideal way out for partners of different riding abilities who want to ride together. Tandems are also great for blind riders or riders with some physical limitations that may keep them from riding a single bike. 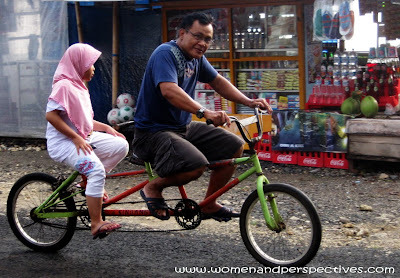 And tandems are also great for two strong riders looking for a new challenge or just for fun.